The Burning (1981) – Stigmatophilia's gore splattered corner of insanity. 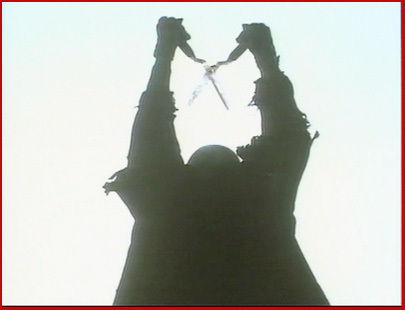 Last, but definitely not least, in our video nasty theme, is the 1981 often overlooked slasher flick The Burning. It is a shame that the garden shear wielding maniac and lead villain Cropsy is sadly left out from the great slasher icons such as Jason, Micheal Myers, and Freddy, because this film is an underrated gem, and personal favourite of my co-blogger. One of the first outings for the now well established Miramax, produced by Harvey Weinstein, and written by Bob Weinstein (Miramax founders) and Peter Lawrence, the project was initially developed as a blatant attempt to cash in on the, at the time, already over saturated slasher genre. Nevertheless it plays out superbly in contrast to some of its lower budget peers. The film also features debut roles from Holly Hunter (blink and you miss her! ), George from Seinfeld aka Jason Alexander, who has a meatier role as Dave, and that guy from Short Circuit Fisher Stevens, as Woodstock, who unbeknownst to me until yesterday is actually now a highly acclaimed director and producer. The score is credited to Rick Wakeman, and works extremely well in building tension, while the outstanding special effects are provided by Tom Savini ( this is a film he does not seem to mind being associated with unlike Nightmares in a Damaged Brain). Less is known about the director Tony Maylam, for which The Burning seems to be his one and only attempt at horror, and who’s other projects include a Genesis concert, and film about footballer Diego Maradonna. This film was confiscated in the UK early 80s video nasty banning, under the obscene publications act, on the objection that the scene showing a woman’s flesh being pierced by a pair of scissors was pushing the line. The American MPAA were similarly displeased ordering scenes to be cut in order for a rating to be allocated, especially the infamous raft scene, and as a result the film was not released in the US until 2007. It has now been widely released internationally and in The States in its fully uncut format. The inspiration for the story was taken from an urban legend. This was a part of the movies’ history I enjoyed finding out about, personally being unacquainted with the Cropsy story as I grew up in the UK. However apparently it was a main staple of the stories told to camp kids in the States throughout the 70’s and 80’s to keep them from wandering alone in the woods. I can imagine for those familiar with the legend this added to the films charm. So much so was I motivated to learn more I watched the 2009 documentary Cropsey, as a companion piece, which I will be reviewing later on. Which while it ended up having nothing to do with the film,I found it proved an interesting insight into the legend behind the character Cropsy. 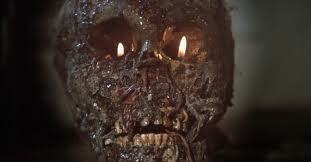 It has been noted that the same legend was the basis for 1982 feature Madman, which was then significantly altered when the makers learned of The Burning’s similarity. As summer camp based slashers go the story is not particularly original. In a prank gone wrong a group of kids accidentally set fire to sadistic and alcoholic camp caretaker Cropsy. This comes in the form of sneaking into his room late at night with a burning human head, complete with rotting flesh and maggots (where they got this from is anyone’s guess!? ), they disturb a sleeping Cropsy who reviles in horror when greeted with the sight of this. In the confusion the skull accidentally gets knocked onto the bed sending the crazed caretaker into a raging ball of flames as a result. He survives though, only just, and after being hospitalised for 5 years is discharged to reek his revenge on those who have wronged him. Cropsy’s opening scenes of freedom are very different to the rest of the movie. In Giallo-esque style we follow him, clad in a black hat and gloves like a silhouette, as he trawls the sleazy side of town looking for a potential victim. This comes in the form of a prostitute. Very reminiscent of a Dario Argento flick, this is one scene which stands out as an obvious ode to Italian directors. Notably after being stabbed the unfortunate lady of the night is then pushed out of a window, breaking glass being a central theme to a lot of Argento death scenes. As the killer stalks his completely oblivious victim we follow him into her apartment as she invites him up a bit of fun, her playfulness quickly turns to revulsion when presented with the extent of his scars. While the scene is both gory and effective it does not seem to fit with the rest of the film, having no particular relevance to the plot, and going against the stereotype of normal summer camp slashers. In most like minded films killing action normally occurs within the confines of the camp, and victims usually have some relation to this, therefore to introduce a completely random kill into the mix could perhaps be considered deliberate attempt by the makers to ensure The Burning stood out from the herd. Such was the thrill of the first kill I found myself wanting for more, and it was unfortunate that it was another half an hour, (46 minutes into the movie),before this was forthcoming. The film builds at a rather slow pace as the central characters are established. This is another feature which makes The Burning stand out as different, given the emphasis on character development, which is sadly lacking in many other films of this kind. Rather than just dashing in and hacking up the cast, we follow the gang of campers, as they joke and lark around enjoying a carefree summer in the sun, watched over by their caring camp counsellors who seem to have a real regard for their well being. One of whom we learn was an instigator in the unfortunate Cropsy prank five years earlier. This is all while being watched from the bushes by the sinister figure of the shear weilding maniac, patiently waiting until the group venture on a canoe trip and are separated from the central camp block. There are a few false starts during these moments which only aid to build tension, while as a viewer you just know it is only a matter of time. As camp counsellor Todd recites the legend of Cropsy around the campfire, the kids initially laugh it off, that is of course until all hell breaks out. When the action really gets going, it is in true shock style, with some masterpiece effects from gore specialist Tom Savini. There are some outstanding set pieces which flow, and not wanting to spoil the party for those who have not seen it, there is no anti climax to be had here. The last half an hour of the film is non stop tension and bloody action, with impalements, throat stabbings and snipped fingers galore. Cropsy plays a game of cat and mouse as he corners his victims and you begin to wonder if anyone will survive. It is only in the last 15 minutes you actually get to see why Cropsy is so pissed off with those kids, and given Savini was given only 3 days to get the burned face look right, he does a fantastic job. Overall if you have not checked this one out it should be on your essential viewing list, underrated, often overlooked, there is some real retro gore action to be had in this movie. With early 80s fashion, (complete with bad haircuts), in abundance, great prog soundtrack, likeable characters, and plentiful blood splattering, chopping, stabbing and impaling to be had, with a few boobies thrown in, miss this and miss out!